Eugene and the University of Oregon’s Hayward Field have been the previous site of six U.S. Olympic Team Trials, the 2014 IAAF World Junior Championships, 16 NCAA Outdoor Championships and the annual Nike Prefontaine Classic. Eugene, Oregon, which has earned a reputation as one of the most appealing and green cities in the country, has been selected by the USA Track and Field Board of Directors as the site of the 2020 U.S. Olympic Team Trials – Track & Field. Showcasing more than 1,000 Olympic-hopeful athletes competing for the right to represent the United States at the Olympic Games in Tokyo, the 2020 U.S. Olympic Team Trials – Track & Field are slated for June 19-28, 2020, at Hayward Field. 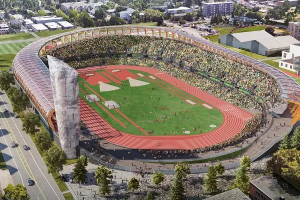 With eight days of competition over a 10-day span, the Trials will be contested in a new, state-of-the-art Hayward Field, slated for completion in the spring of 2020. Just over one year later, Hayward will again take center stage when the country welcomes the world to the state of Oregon for the 2021 IAAF World Championships. The U.S. Olympic Team Trials – Track & Field is the world’s largest and best track meet outside of the Olympic Games and IAAF World Championships and is a collaboration between the U.S. Olympic Committee and USATF. Led by CEO Michael Reilly, TrackTown USA will serve as the local organizing committee for the Olympic Trials. The 2020 U.S. Olympic Team Trials – Track & Field is part of an Olympic qualifying journey that also includes the 2020 U.S. Olympic Team Trials – Marathon, which will be held February 29, 2020 in Atlanta. The site of the 2020 U.S. Olympic Team Trials – 50 km Race Walk, will be announced in coming weeks.